Here is Part 3 of my look at how the top 5 SNG players stack up for the first four months of 2012 in a variety of different formats on PokerStars. This part is focused on Multi-Table SNGs. Use the link below if you missed the earlier parts in the series. Multi-Table SNGS, or MTTSNGs (yes, one of the "T"'s in the generally used acronym is somewhat superfluous) have risen in popularity over the last few years. I think this can largely be attributed to 9-man SNGs becoming solved/reg-infested/unbeatable, with players looking for a player-pool with a better fish:reg ratio and higher attainable ROI's. They can also be good for recreational players, as 180-mans especially have some of the attributes of MTTs that can see a massive return on a small investment for winning. 45-mans and 180-mans also have hourly sync breaks so can be mixed in by MTT players. I've been praying multiple times a day for sync breaks to be added to 18-mans, but alas, PokerStars have so far decided not to add them for these games so far. 'live@pompeii' is American Poker Pro Darren Maroni, who relocated to Mexico in order to grind for Supernova Elite this year where he is sharing a house with another sick SNG grinder, 'jdawg91'. He's not too far behind SNE pace, and is having an extremely consistent year at the 18-mans so far. 'JayPez' is fellow Brit Jon Parsons, and similar to 'live@pompeii' is keeping an interesting thread on 2+2 (here) detailing his progress throughout the year. 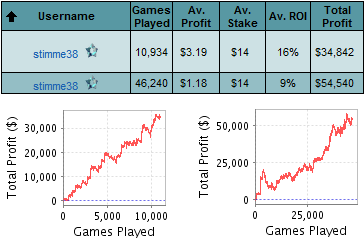 He has been using 45-mans as a platform, in order to take-shots at bigger MTTs and bigger stakes MTTSNGs, and has been very successful with this approach for the year so far (aside from having to rebuild his bankroll last month! ), having earned ~$40k for the year so far. One interesting thing about JayPez is that he chooses to play on multiple different poker sites as a means of table selection and to get in extra volume. I respect this as personally that would tilt me too hard: I like the smoothness of the PokerStars client and the functionality of TableNinja too much :). 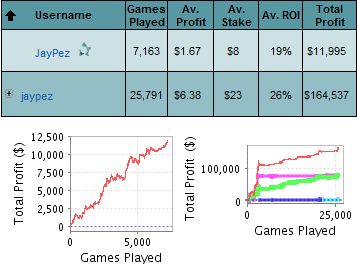 Across all sites Jay-Pez has cashed for over $1 million in tournaments. Unfortunately 'stimme38' is the only player I wasn't able to find out too much about. He is a German native and the vast majority of games he has played on PokerStars are 180-mans. He is having his best year by far, and based on his ROI, his game has really improved, as he has earned more in the 11,000 games than he had in the 35,000 games he played before this at similar stakes. 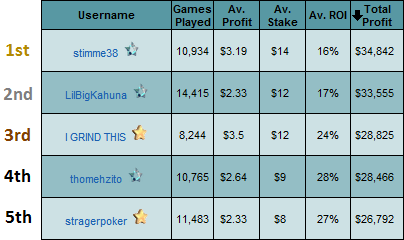 'LilBigKahuna', in 2nd place, won this leaderboard in 2011 with just north of $100k profit, and it looks like stimme38, him and several others are vying for 1st place, and a similar profit, in this leaderboard this year. 5 Comments to "SNG Superstars 2012 (Part 3 - MTTSNGs)"
yes , what did he with the 1 million? i'd not play 9$ 45man. Would love to see attainable ROI in the different games, based on the buyin-level. @Master It's on my to do list!